I always feel that our life is also like test cricket where we are like the batsmen in the game. We face many opportunities, challenges, and problems in our life. The opportunities, challenges, and problems act like balls bowled to us in our lives. In my opinion, we should try to score fours and sixes on opportunities, that is, making most of them, take runs between the wickets on the challenges or you may hit them for boundaries but that’s up to you which means you should not take your challenges lightly but also not let them (challenges) get over you and defend the problems or leave them behind them and don’t look back like a batsman leaves an unplayable ball to get past him to the wicket-keeper. Now, it’s the age of t20s, the age of scoring more runs in fewer overs, that is, achieving so much in less period of time. In t20s, batsmen try to score runs even from very good deliveries, since, this format has field restrictions which the test format doesn’t have. The way a batsman plays in this format, he may get dismissed early or play the full limited overs, the chances are equal for both, it’s 50-50. Sometimes, in this format, a batsman makes a good ball look like a bad one by shifting their positions in the crease and innovating their hitting techniques, that’s creating opportunities from problems and challenges. Entrepreneurship can be a good example of a batsman playing innovative shots of good balls because to be an entrepreneur you have to be self-employed, you have to do something new which other people usually don’t do like the batsman playing innovative shots in the shorter version of the game. There is another way in which the entrepreneurs can be looked upon. Entrepreneurs are like bowlers who bowl opportunities, challenges, etc to the other batsmen in the game. When I get an interesting situation, I always compare it with cricket. For example, during my board exams, I took the exams like the world cup of exams. Like every student, there were some subjects which seemed easier to me and some seemed difficult. According to their difficulty levels, I had labeled the subjects in the name of the playing countries. While attending a question paper, the question paper was like a pitch to me. During the exams, we used to get 15 minutes for examining the pitch, in other words, for reading the question paper. While solving the paper, I used to solve the questions which seemed easier to me because I had learned from cricket that we have to be watchful of the ball and the pitch in the initial overs or it may affect the game later. During the last 30 minutes, I was always in a hurry, because, I had to solve all the questions in just 30 minutes like the batsman trying to score big in the last 10 overs. Which format do you prefer in your life? If you ask me, “which format of the game you like the most?”, then, I would say the shorter one but I would love to take my life as a test cricket and definitely, everybody would not have the same views as mine. There are different people with different thoughts and capabilities. Some would love the longer version of the game and some would love the shorter one but there is one thing about which I am sure that they can definitely take the inspiration from the game or the game they love. That was quite an interesting read. Well worded and justly articulated! 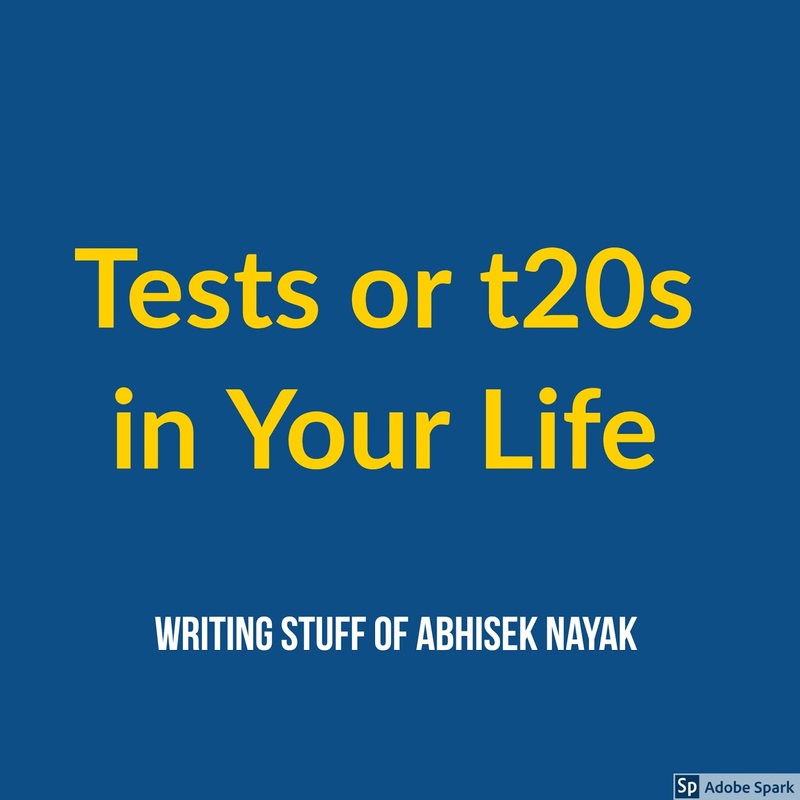 This is such an interesting article Abhishek .Who knew cricket and life has many similarity .I liked the 20 /20 anaology .Life on a daily basis is like that but we need to prepare ourself for test ,matches too! 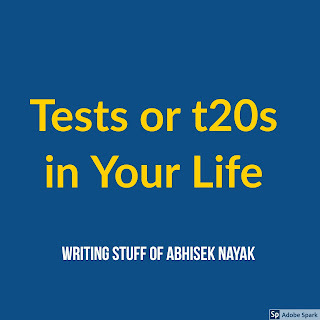 Very interesting read, Abhisek...I think the point of relating exams to the world of cricket is a great tactic to motivate students during the strenuous exam period. I prefer to look at life as a test cricket from the long perspective and as T20 on a daily basis...´Carpre Diem philosophy´ :) Please read my Week 6 post for #Superbloggerchallenge2018 here: https://thetinaedit.com/2018/03/25/top-5-key-learnings-from-the-super-blogger-challenge-2018-so-far-superbloggerchallenge2018/. Thank You! For a cricket crazy nation like India, perfect example to relate to life. Loved your ideology. Interestingly portrayed. If we give it a deeper thought, true that this is the age of shortlived memories, n hence probably we have subconsciously accepted the t20 phenomenon. Both in cricket n in life. Although as u mentioned, given a choice I wud traverse the test match path.